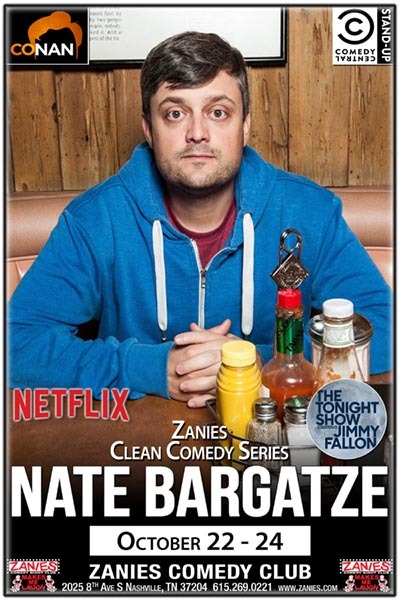 Nate Bargatze: Hailing from Old Hickory, Tennessee, rising stand-up comedian Nate Bargatze is selling out shows across America. On March 26th, Nate’s first solo one hour Netflix special, “The Tennessee Kid,” will premiere globally. Nate followed in the showbiz footsteps of his dad, a former clown turned world class magician, who’s influence is seen on Nate’s 2015 debut special ‘Full Time Magic’ and his debut album “Yelled at By a Clown.” Nate’s half-hour Netflix Special “The Standups” premiered on July 4th 2017 to rave reviews. In addition to touring the country as a headliner, Nate toured in arenas with Chris Rock on his 2017 Total Blackout Tour. He currently has a deal with 20th Century Fox to develop his own TV show. Nate’s comedy is both clean and relatable, evident in his six appearances on The Tonight Show Starring Jimmy Fallon following four appearances on Late Night with Jimmy Fallon. He appeared on Conan four times, was a recurring guest on @midnight, and had his own Comedy Central Presents in 2011. Off-screen, Nate was part of Jimmy Fallon's Clean Cut Comedy Tour, and has done live shows for the troops in Iraq and Kuwait five times. He regularly performs at Bonnaroo, SXSW, Oddball Comedy Festival, Sasquatch, Clusterfest, and the JFL Montreal Comedy Festival, where he’s received critical acclaim multiple years in a row. Nate was featured as one of Esquire's ‘Best New Comedians’ by Jim Gaffigan, one of Marc Maron's ‘Comedians to Watch’ in Rolling Stone, one of Variety’s “10 Comics to Watch” for 2015, and as #1 on Vulture's ‘50 Comedians You Should Know’ in 2015. His debut one hour special, Full Time Magic, premiered on Comedy Central that spring, followed by his debut album, “Yelled at by a Clown,” which reached #1 on the iTunes Comedy Charts and remained on Billboard’s Top Ten Comedy Charts for weeks. He continues to tour across the country and internationally.